Here you will can find a damp meter for different types of materials. Using a damp meter is a very simple and comfortable task to detect the moisture of the materials both resistively and capacitively. A damp meter is used to determine moisture of walls, concrete, attics and wood. A damp meter is also used to detect absolute moisture in the field of agriculture to ascertain the correct time to plant a crop to achieve the highest yield. The damp meter will control the process of drying in grain and animal feed by means of telling the user when it is appropriate to move onto the next stage of the drying process. Different moisture probes can be connected to the damp meter corresponding to the materials which are to be measured. For most of the materials you will find calibration curves within the internal memory of the damp meter. You then only need to select the appropriate calibration curve for the material that you wish to measure. If there is no deposit characteristic curve for a material, the user is able to program specific characteristic curves (only possible with the FMD). In order to do this, tests for the correlation must be done with the help of a drying cupboard. With the appropriate software the user is able to document measured results of the damp meter and to use these results for further purposes. Also in the field of renewable energy the damp meter is needed as the absolute moisture of solid biomass and wood can be determined, with the drying completed with a solar kiln as to provide a zero carbon energy source. Especially during the manufacturing of wood pallets the damp meter can be used to ensure quality guidelines. PCE-PMI 1 is a nondestructive concrete moisture meter or dampness tester that measures the moisture content of concrete and other construction materials. Ideal for use with floors, ceilings and walls, this electronic moisture analyzer enables fast, reliable, noninvasive moisture measurement without damaging the surface. PCE-PMI 2 is a nondestructive concrete moisture meter or dampness instrument that measures the moisture content of concrete and other building materials. It offers many preset characteristic curves based on alternative material densities. This digital moisture device gives quick and accurate moisture measurement without causing any damage to the test material. PCE-SMM 1 is a damp meter for soil ideal for use in agriculture, crop science, horticulture, botany, landscaping, gardening and environmental testing applications. This portable handheld moisture meter or analyzer measures soil moisture or humidity quickly, easily and accurately. Absolute Moisture Meter PCE-W3 for waste paper. The Absolute Moisture Meter can detect absolute humidity in waste paper in order to determine the exact humidity content in the collection centre or in the paper-making factory. 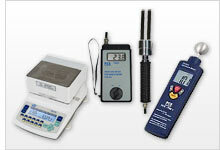 All test instruments come manufacturer calibrated. ISO certification can be ordered as an option. PCE-WMH-3 is a portable handheld digital damp meter or analyzer used to measure the moisture content of wood. This hammer-style wood moisture analyzer features preset characteristic curves for measuring moisture in 270 different wood types. The Damp Meter PCE-780 consists of an infrared thermometer and an integrated humidity meter. With the two sensors, it can record values to determine the dew point. If this dew point is reached or undershot, there is a risk of moisture settling and thus of mould. This Damp Meter HM-BP1 has been developed to measure moisture in wood pellets quickly and accurately.